All Scan/US subscriptions give you this: Trade area analysis, territory creation, demographic reports, maps of income distributions in neighborhoods all across the United States. With the Lifestyle edition subscriptions, you can put an industry-leading lifestyle segmentation system to work in your markets. Scan/US Premium Edition: Lifestyle Subscription adds Mosaic	Neighborhood segments to your Scan/US subscription. Experian's MOSAIC lifestyle segmentation database is available for Scan/US. Experian's MOSAIC consumer targeting system enables you to identify target neighborhoods that are most likely to contain the types of consumers you are looking for. The new MOSAIC now offers 71 consumer segments within 19 social groups. Call us at 800-272-2687 for more information about Scan/US Premium Edition: Lifestyle Subscription. Mosaic® USA is a household-based geodemographic segmentation system developed by Experian. Mosaic classifies all households and neighborhoods into seventy one segment types based on location and population characteristics. The classification of households allows summaries of the number of households in each category to be presented for any geographic unit. This permits a narrative-based neighborhood classification, according to how many households fall into categories such as "Couples with Clout (A05)", "Jet-set Urbanites (A06)", "Golden Year Guardians: Town Elders (Q64)", or "Significant Singles: Bohemian Groove (K40)". 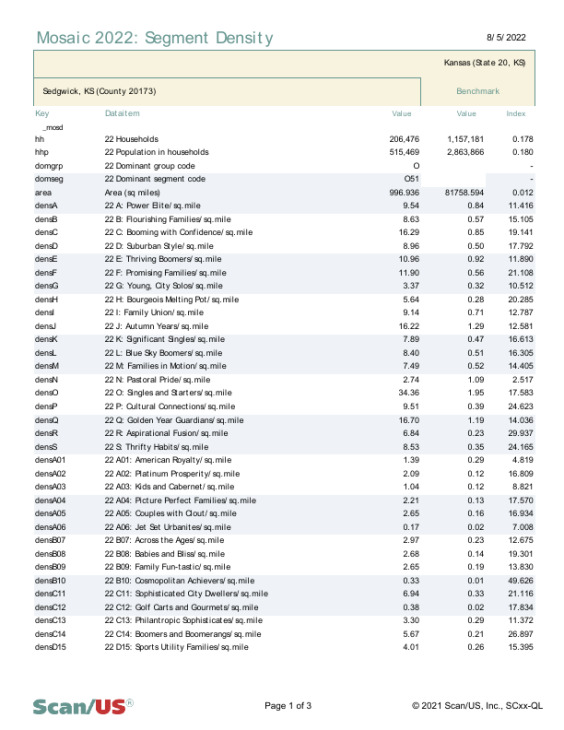 Each Census block group (of which there are 217,182) is assigned a dominant segment of one of seventy one segment types based on its location and population characteristics. The number of households in each segment are also shown for each Block Group. In fact, the dominant segment is shown for higher levels of geography -- tracts, ZIPs, states and counties -- as well as the smaller-sized Scan/US Microgrids (of which there are 2,480,187). A significant advantage of a segmentation system is that it can simplify comparison of market areas where more than one factor influences purchasing. The Scan/US subscription already does give you household age, income, ethnicity, owner/renter, and vehicles available. These are all very suitable for mapping. What the Mosaic® USA segments contribute is the ability to create a single index combining multiple factors. 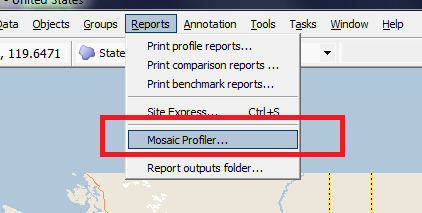 Many people use Mosaic in the form of a report for a specific market area (as shown above). First, what is segmentation? Segmentation is when you divide a target market into segments. Segmentation is implemented with a statistical technique called Cluster Analysis, in which several "dimensions" are used to find similar collections or "clusters" which occur together. Large companies with statisticians on staff can do a custom cluster analysis, based on the sales of their own products, using information they have about their customers, such as income, credit record, and so forth. The Mosaic® USA lifestyle segmentation is Experian's cluster analysis based on household characteristics. The basic idea of geodemographic segmentation is to add location type (i.e. urban, suburban, rural) to the collection of other inputs to the cluster analysis. The theory is that communities are formed of people with similar backgrounds, interests, and means, and therefore consumer preferences as well. In other words, the characteristics of interest are those that either influence consumer behavior, or are associated with it. What population characteristics are used? As an example, here is an excerpt from the Mosaic® USA documentation describing just one of the 19 groups, Blue Sky Boomers (L), which consists of three household segments: L41:Booming and Consuming, L42:Rooted Flower Power, and L43:Homemade Happiness. A full description of all 19 groups and 71 segments runs over 300 pages! In Blue Sky Boomers, older, empty-nesting couples and singles have settled in small towns and waterfront resorts in anticipation of their retirement years. The three segments in this group are about evenly divided between married couples and widowed and divorced individuals. More than 80 percent are between the ages of 50 and 65. Most are white and have high-school educations and working-class sensibilities. These households tend to work in sales and service-sector jobs, supporting a resort economy in towns that offer weekend getaways and longer summer vacations for wealthier city dwellers. Blue Sky Boomers are found in small towns and waterfront resorts - both seaside beaches and lakefront communities - from California to Florida. Many households are concentrated in the South, with the warmer weather favored by retirees. These Boomers are homeowners who tend to live in modestly-priced ranch houses, cottages and mobile homes. With childrearing days behind them, they have the discretionary cash to purchase adult toys like boats, campers and pickup trucks. While vacationers may swell the streets of their towns every summer, most of these year-round locals have lived at the same address for over a decade. Most Blue Sky Boomers are high-school educated and work at a mix of sales, service-sector, professional and blue-collar jobs, though nearly one-quarter of households contains a retiree. Unlike their seasonal neighbors, they earn lower-middle-class incomes, averaging about $55,000. However, because their expenses are low and their mortgages mostly paid off, many enjoy casual and comfortable lifestyles in their bucolic settings. Located in surroundings like theirs, no one would fault Blue Sky Boomers for spending much of their leisure time outdoors. These households enjoy fishing, boating, hiking, hunting and gardening. However, they also have enough money - thanks, in part, to conservative investments - to travel regularly by car and RV to domestic locations. Their social lives typically revolve around their churches, clubs and unions. For a splurge, they'll go out to home-style and casual restaurants, take in a music concert or head to a weekend NASCAR race. When they want to relax, they like to read books, listen to music - from bluegrass to soul to classical music - do woodworking and needlework or have friends over for cards. These are the households that haven't forgotten the art of baking from scratch. Blue Sky Boomers are no shopaholics. They keep their clothes as long as possible and shop only when they need to - preferably at local stores. When they go on a big shopping run, these price-sensitive consumers typically head to discount department stores to stretch their money like Walmart, Dollar General, Family Dollar and Big Lots. Many are late adopters of new products, especially consumer electronics. They don't often acquire the latest audio and digital devices: their living rooms are still outfitted with DVD players and traditional tube TVs. In this"buy American" group, residents look for domestically-made pickups and cars - and lots of them. More than half the households in this group own three or more vehicles. In Blue Sky Boomers, traditional media still reigns supreme. To keep up with local news, many subscribe to a daily newspaper and read it from cover to cover. They also read magazines, especially those that reflect their down-home lifestyle, including titles like Country Living, Family Handyman, Ladies' Home Journal and Reader's Digest. This aging generation never lost their interest in music, listening to radio stations that play country music, golden oldies and classic rock. However, many consider TV their chief form of entertainment, tuning in to newscasts, game shows, dramas, how-to shows and history programs. They dislike most forms of advertising, opting out of direct-mail lists and avoiding TV commercials as much as possible. Many tend to be okay with the billboard advertising tucked into the landscape near their homes, though. Politically, Blue Sky Boomers are a moderate lot: self-described Republicans with a right-of- center tilt. They're also progressive on environmental issues and protective of any threats to their rustic communities. While most wouldn't think of marching in a protest, they support causes financially, often backing arts, political, environmental and public broadcasting organizations. Still relative newcomers to digital media, Blue Sky Boomers are becoming increasingly comfortable with the Internet. The majority has a desktop computer at home, and they use the Web like a virtual library, visiting sites for information on subjects that are near to their hearts: cars, cruises, fishing and medical information. They also go online for business purposes, including banking, trading stocks and shopping. Though they're not completely comfortable with new technology - they're more likely to go online using dial-up access than a wireless connection or a mobile phone - they've made gunbroker.com, ebaymotors.com, seniorpeoplemeet.com and theanimalrescuesite.com some of their favorite sites." As you can see, the main information you get is age of the household, how big it is, how much they make, how well educated, their type of job, stage of life, and where they are located. This tale is seasoned with aspects of their political, community, digital and, most important to consumer-oriented audiences, their retail life. Mosaic Segment density is a NEW Data List we have for our Mosaic USA lifestyle customers. It shows the density per square mile, of all mosaic segments, in any area you define or select. This datalist & report is included with every Scan/US Premium Edition: Lifestyle subscription. Once you have mastered the shorthand of categorized segments and groups of segments, you have a tool to compare different geographic market areas. Which leads us to the Lifestyle Pro subscription. The LifeStyle Pro Edition	Mosaic Profiler adds a functional benefit to the databases included in the subscription: Customer list characterization based on Mosaic® USA. You get all the demographics of a Scan/US standard subscription, plus the Mosaic segment summaries of the Lifestyle subscription, and you can run a customer list through the Mosaic Profiler, and get a four-page "profile" that tells you more about your customers collectively than you might get from looking at a map alone. In other words, when you have a list of customer locations with geographic coordinates, you can build an informative profile based on the segment characteristics of those locales. 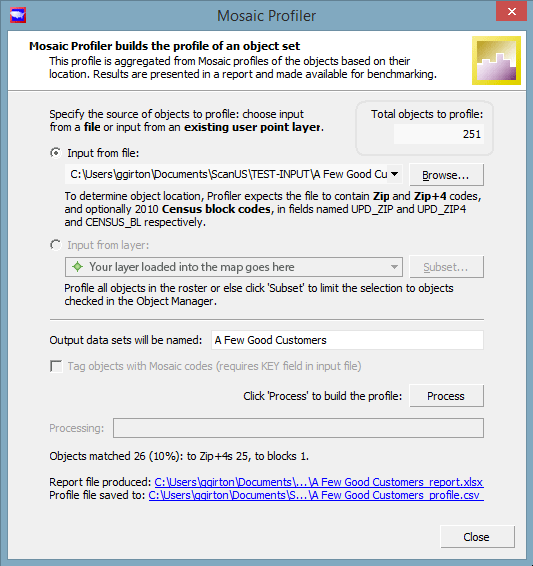 The Mosaic Profiler takes a previously geocoded customer address list (ZIP+4 or Census block) as input, and creates a profile of that list by segment type. You can see the Mosaic segments (and groups) which characterize the areas where most of your customers live. Then you can compare these to Mosaic segments data in other trade areas to see how well the new markets would match what you now know about your customer profile. Mosaic assignments are updated annually by incorporating updated demographics into the segmentation model, ensuring that the assignment is as accurate as possible given shifts in local area demographics. © 1992-2019 - Scan/US, Inc.